The influenza pandemic of 1918 killed 50 to 100 million people worldwide, including more Americans than died in combat during World War I. Unlike the seasonal flu, which still costs the lives of up to 50,000 each year in the United States, the so-called “Spanish flu” produced an excessive immune response in patients known as a “cytokine storm” and proved disproportionately fatal among healthy adults in their twenties. A century later, veteran emergency room physician Jeremy Brown’s Influenza explores the 1918 pandemic and the disease’s more recent history from numerous vantage points—scientific, sociological, economic, and ethical. Brown, who runs the Office of Emergency Care Research at the National Institutes of Health, is clearly a man who knows his flu. Not just the physiology of the virus or the epidemiology of the illness, but countless fascinating and even fun facts about the scourge. For instance, he reports that the incidence of flu rises significantly in cities whose hometown teams appear in the Super Bowl (likely due to the increased social interactions related to the event), but not in host cities. Brown also displays a gift for distilling complex biological concepts with lucidity. Even readers familiar with the history of the flu may find themselves engrossed by Brown’s extensive research and compelling anecdotes. A good portion of the historical narrative is devoted to the 1918 pandemic’s origins—which may have been in rural Kansas or at a British military camp in France or even in northern China, where an illness “resembling influenza” might have been circulating for several years. Certainly not Spain. In fact, the reason the pandemic was first reported widely in Valencia was probably because World War I censors in combatant nations downplayed or stifled reports to protect morale. Neutral Spain did not face such pressures. Brown exposes the various ways in which social forces rendered the pandemic worse—such as Philadelphia’s decision to sponsor a war-bond parade at the outset of the epidemic that “was essentially a marching band of influenza.” The pageant vastly increased human-to-human contacts, including those between military recruits and civilians; two days later, more than 100 flu victims were dying daily in the city. Of course, the treatments available often proved just as deadly: exposure to poisonous gasses, mercury, lethal doses of aspirin, and quinine. Among the most surprising revelations regarding the 1918 pandemic were its long-term effects. Columbia University economist Doug Almond discovered that babies born in 1919 (who were exposed to flu in utero) displayed “higher rates of physical disability, achieved a lower level of education, and earned lower incomes as adults” than individuals born in 1918 or 1920. Another riveting portion of the narrative relates the effort to locate and sequence the genetic material of the Spanish flu. Pathologist Johan Hultin travels to the permafrost of Alaska to find samples in the lungs of frozen victims, gaining the trust of the few living survivors in Brevig Mission. He found no viable flu on his first expedition in 1951. Undeterred, he tries again 46 years later. Brown does an excellent job of dispelling myths about influenza. He provides evidence from the scientific literature when available, but then interprets and synthesizes it for the befit of lay readers. Can Google algorithms predict flu outbreaks in advance? (Apparently not, despite much of the publicity surrounding Google Flu Trends.) Is there a benefit in taking the antiviral medication, Tamiflu? (Possibly shortening of symptoms by 24 hours, but at the cost of side effects.) Does it make sense for the government to stockpile millions of doses of Tamiflu? (Only if one owns pharmaceutical stock, because “the push toward stockpiling Tamiflu began in earnest on the basis of species and probably biased recommendations.”) To his credit, Brown readily admits when the results are inconclusive and is not afraid to acknowledge what science does not yet know. Influenza tackles many of the ethical issues relating to infectious disease research with nuance and balance. Brown investigates the controversy surrounding the development of gain-of-function variants of the flu virus that some fear could be weaponized or accidentally released. He tackles the issue of whether details about how the 1918 virus developed should be published—as they ultimately were in Science. The details Brown amasses range from the revealing to the absurd. Among the former, he notes that an increase in electrical fires at Egyptian poultry farms may reveal a bird flu outbreak—as farmers probably engage in preemptive insurance fraud since they cannot be compensated for birds killed on account of flu. 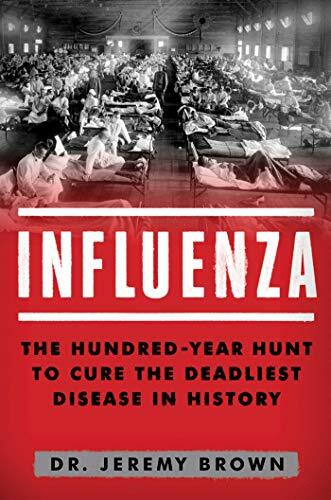 Influenza: The Hundred Year Hunt to Cure the Deadliest Disease in History is a highly engaging read. Yet it is also an essential clarion call for more action on the danger posed by the flu. Brown writes: “We don’t know when or where the next viral pandemic will occur, but it will occur.” That’s not a threat to sneeze at.